Need a middle distance run as part of your training this fall? The 11th annual Susco 8k run and 2k walk will take place on September 15, 2018 at South Lakes High School in Reston, Virginia, race start time is 8:30 am. 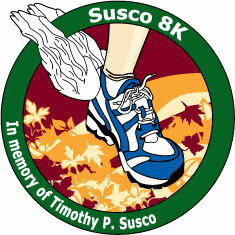 The Susco 8k is held each year in memory of Reston native, Timothy P. Susco, who passed away in 2007 from a ruptured brain aneurysm. The race starts and ends at South Lakes High School, where Tim graduated, and runs along the rolling hills of Reston, just like Tim did as a four-year member of the South Lakes track and cross-country teams. The 8k distance is a perfect distance for those just starting out, those wanting a little more challenge than a 5k and for those who are looking for a good warm up for their longer distance runs later in the fall. The Susco 8k and 2k supports brain aneurysm research to help others who may be affected by brain aneurysms, but the race also supports organ donation awareness to encourage others to give the gift of life as Tim did. 8k: Early Bird $35 until August 28, then $40 until online registration closes at 8:00 pm on September 13 and during packet pick up. $45 on race day. 2k: $20 through packet pick up, then $25 on race day. Packet pickup will be held at Reston Hospital Medical Plaza (1830 Town Center Parkway, Reston, VA 20190) on Friday, September 14 from 3:00-6;00 pm, and then race day morning from 7:30-8:30 am. The top 3 male and females finishers and top male and female Master's runner will receive cash awards. The top two male and female in the following age groups will receive gift certificates; under 19 & U, 20-24, 25-29, 30-34, 35-39, 40-44, 45-49, 50-54, 55-59, 60-69, 70 & Over.